One of the leading weekly news magazines in France ran a headline last month: “The CGT brings back class struggle.” On TV this morning, President François Hollande is insisting, sweating: “The situation is quite different from that of 1968!” What are the chances of French workers inflicting a decisive defeat on the “Socialist” government’s neoliberal savagery? Through April and May, millions of workers and students have taken to the streets in over 100 towns across the country for seven separate days of action against the hated new labour law (loi travail) proposed by the Socialist Party (Parti Socialiste) government. An opinion poll in early May showed 74% of the population was opposed to it (70% saw it as “in favour of business”). Only 3% of those asked declared themselves “completely in favour” of the law and 22% “moderately in favour”. But the first reading of the bill was rushed through parliament by means of a special “49.3” order allowing the government to refuse any debate. The bill now has to go through the Senate and other stages, which will take weeks, and the movement against it is not about to give up. Union leaders have been unwilling to go beyond one-day strikes, partly in fear of bringing down the government and risking the right wing parties, even more hostile to union rights, coming into office. But, since the law is worse than what the Right did when they were in, millions want to go further. This is why the movement was waiting for a rank and file initiative to take the struggle forward. It came, a few days ago, from the oil workers. As I write, all eight oil refineries in France are on strike, and rail workers in some of the more radical depots are out, too. Dockers at Le Havre, the port which receives 40% of imported oil, voted an all out strike yesterday (only 5% voted against). Large crowds of pickets are blocking oil storage points, and petrol shortages are spreading. The riot police have attacked some blockades in the middle of the night but the authorities are hesitant. A decisive deepening of strike action now can defeat the government. Other railworkers, Paris metro workers and civil servants will be on strike for the eighth and ninth days of action in the next two weeks, and the leader of the CGT, the most militant of the union federations, is now playing an excellent role, calling for a “generalisation of strikes” until the bill is withdrawn. This bosses’ charter of a bill, unveiled several weeks ago, went much further than right wing former president Nicolas Sarkozy had ever dared to go when he was in office. It aims to slash compensation for unfair dismissals, allow apprentices and others to work far longer hours, cut back employers’ obligations for medical supervision of workers, and reduce payments for overtime. Worst of all, it would allow any local agreement to trump national rights won decades ago and impose worse conditions than existing national minima. Not daring to abolish national rights directly, the bosses are hoping that fear of unemployment will allow them to bully local union reps into signing away hard won guarantees. After a first day of action in March, the government backtracked on a couple of the bill’s provisions – enough to win the agreement of the most conservative of the union confederations, the CFDT. But the essential core of the bill remains. Socialist Party prime minister Manuel Valls and president François Hollande are rightly very worried by the fightback. Just 10 years ago a huge, historic movement of students and workers forced the right wing government of the time to withdraw a law destroying labour rights for younger workers, even though the movement rose up weeks after the law had been voted through parliament. Since he was elected in 2012, president Hollande has given plenty of tax breaks to the bosses, maintained a pay freeze for public sector workers and a put a severe brake on recruitment of replacements for retirees. But, over the last 30 years the French ruling class has had less success smashing job security and working conditions than in most European countries. The bosses are impatient and this law is much more savage. The right wing press started crowing: “At last Hollande is daring to modernise France” – but they are showing signs of panic now the movement is on the rise. The authorities have used much higher levels of police violence than have been seen for some years, making the most of the state of emergency declared after the terrorist attacks last November. On 1 May the traditional trade union demo was attacked by riot police for the first time for 35 years. A young man in Nantes lost an eye when shot at with a flashball gun, and numerous videos of police beating up young people are circulating. In one video you can hear a police inspector giving instructions to his men before they attack: “Use maximum violence,” he says. Demonstrators who are arrested are risking long prison sentences. Denunciations of “black bloc” type groups attacking the police or smashing up shops are used to try to discredit the movement. Indeed, such elitist small-group tactics put other demonstrators in danger and have been shown to facilitate police infiltration – but they are in no way comparable, in terms of destroying people’s lives, to the government’s labour law plans. He also claimed: “Salafism is winning the battle for Islam in France,” and this week he has been attacking supposed “Islamoleftists” (a label I am happy to wear, in the context). He is trusting that widespread Islamophobia on the left – including on the far left, despite some hard-won progress over 20 years – will allow his message of hate to hit home with little opposition, and he is relying on the fact that most people have no idea what Salafism is. Muslim headscarves, he went on to claim, aim at “making women subservient”. In parallel moves, a defamatory campaign to ban left reformist Muslim intellectual Tariq Ramadan has been in all the media. The left is paying the price now for its refusal to actively fight Islamophobia over recent decades: the government and the far right have at their disposal an easy weapon to divert attention from working class unity and towards racist division. The right wing press are publishing paranoid supplements on the dangers of supposed masses of extremist muslims in France, and most of the activist left is saying almost nothing in reply. Even anticapitalist groupings are deeply divided over Islamophobia, and their leaders tend to avoid the issue. Nevertheless, even playing his strongest cards – using police violence, denouncing young rioters and flattering the Islamophobes – Valls’s popularity is at a record low. Only 22% of the population have confidence in him. This afternoon on television, denouncing “minorities” who want to stop his law, he sounded pretty ridiculous: he is betting his career on a victory against the movement. One exciting aspect of the situation is that the movement has seen the re-emergence of forms of action not seen for some years. Dozens of high schools were blockaded by students to allow young people to go to the demonstrations without being disciplined for missing classes. A few universities were also blockaded, and many more have been organising mass meetings, speak outs, films shows and debates about the labour law and workers’ rights more generally. A National Students Coordination has been meeting, with delegates from over 40 universities. The coordination has voted to demand not only the abandonment of the labour law, but also the repeal of the state of emergency, which since November has been targeting activists and Muslims alike. Inspired by the Occupy movement in public squares a few years back in Egypt, Turkey, Greece and Spain, there has appeared a square occupying movement on a large scale, calling itself “Up All Night” (Nuit Debout). Thousands and sometimes tens of thousands of people have gathered in the Place de la République in Paris every night, and similar events have been organized in dozens of other squares around the country ( in Strasbourg, Nantes and Toulouse, in particular). People listen to refugees and strikers, defenders of sustainable agriculture or high school students, and actions are organised in defence of arrested demonstrators or around other demands. A tremendous public forum dedicated to people power has been opened up. Commissions organise sit-ins, first aid, food or music. Such forums are, among other things, a sign of distrust in mainstream political parties of the left, though the debates are very political. Debates on education or bullfighting, Islamophobia or working class suburbs can be heard every night. The public square forums are not cut off from action. Groups from Up All Night have been demonstrating with refugees, supporting theatre employees’ occupations of their workplaces, and twinning with groups of railworkers. Many understand the particular importance of workers’ action, and meetings on “bringing the struggles together” invite trade union activists and leaders to debate how to move towards a general strike. National CGT union federation leader, Philippe Martinez, joined the debate in Paris two weeks back. This “Up All Night” movement has now been going strong for more than two months. It is no exaggeration to say that a new generation of activists is being formed. In Paris, the running is being made by “non-party activists”, but in provincial towns, members of various radical left parties are often central to the movement. Apart from the fragility of the government and the horrors of the proposed new labour law, political debate is living under the shadow of the 2017 presidential elections. Hollande is beating all records for unpopularity for a president, despite the terrorist atrocities that one would expect to encourage feelings of national unity. In France, presidential and other elections have two rounds of voting. In the first round there are several candidates, while the second is a run-off between the two most popular. Many on the left are panicked by the sadly realistic possibility of a second round run-off between the traditional right and the fascist Front National leader Marine Le Pen. Le Pen has had her father – FN founder Jean-Marie Le Pen, who is infamous for calling the Holocaust a “mere detail” of history – thrown out of her party and has managed to “modernise” the FN’s image, for eample by putting forward a spokesman who is gay. For the moment, since class struggle is so high, Le Pen is inaudible, but she has high levels of passive electoral support. The fear of such a second round run-off has led a number of Communist Party members and other left reformists to propose “primaries of the left” to choose a single left candidate before the first round, and logically eliminate the danger of the left being absent in the second round (since all primary candidates would promise to support the winner). But would it really be possible for the radical left to campaign for Hollande or Hollande’s candidate, now his Socialist Party government has moved so far in favour of the bosses? The idea of left primaries seems to be dead on its feet. Jean Luc Mélenchon of the left reformist Left Party (Parti de Gauche), a fine speaker for class struggle politics, has announced his own intention to stand. His campaign is likely to be boosted by the fact that he has announced his intention, if elected, to push through constitutional changes and then call new elections. The New Anticapitalist Party (Nouveau Parti Anticapitaliste – NPA) and Lutte Ouvrière will each have their own candidate. A victory of the movement against the labour law would tremendously reinvigorate the struggle against austerity, for trade unionism and against division – but it would also change the prospects for the elections. It would make it easier for left reformist and revolutionary ideas based on class struggle to take root in a new generation of activists and voters, despite the many weaknesses of the revolutionary left in our country. Organisations such as Lutte Ouvrière have reacted with much sectarianism to the Up All Night movement. Other organisations such as the NPA or Ensemble (my own grouping) are extremely federalist, with branches in each town able to do more or less what they want while the party newspaper is non-existent or little used. Ultra-leftism is widespread: many revolutionary activists applauded the vandalising of Socialist Party offices in various towns, not understanding that these actions made the government’s attacks easier by reinforcing party loyalty in the left wing of the Socialist Party. (This situation was worsened a couple of days ago when the Socialist Party’s offices in Grenoble were hit by 12 bullets from a gun). In antifascist networks, it is not rare to hear: “The Socialist Party is fascist too.” Such attitudes make it much harder to persuade workers who have contradictory attitudes to the Socialist Party to join the struggle, in “Up All Night” or elsewhere. These are exciting times to be an anticapitalist revolutionary in France, though progress will be easier the more anticapitalists understand that a dose of centralisation does not have to be bureaucratic and oppressive, but can be democratic and invigorating. Recruiting new revolutionaries is going slowly indeed and needs to be made a priority, but on the demonstrations and in the meetings we are beginning to see numbers of young adults newly involved. And political meetings are the one place where I enjoy feeling old, since it means that fresh troops are arriving. John it seems that the various French union confederations are bitterly split over the dispute. Is there any inter union solidarity despite that? The CFDT leadership is clearly backing the government, and it is a big union confederation. All the others, for example CGT, FSU, SUD, are for the withdrawal of the bill. 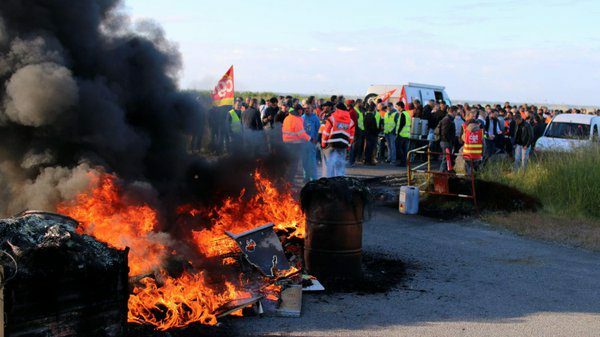 But the continuing strikes outside of the days of action arebeing voted on workplace by workplace in general meetings, so there are places where CFDT people are on strike too. UPDATE 25th MAY : Air traffic controllers have called for a two day strike, and workers in nuclear power stations will also be stopping work in protest at the Labour bill. Its passage through parliament, if it is not stopped, will take until July. In some places groups of farmers with tractors have joined the blockades. More nuclear power stations have voted to strike : often with majorities of 80% or more.On the TV news, Prime Minister Valls says there is no possibility of him withdrawing the bill. A newly released poll says 61% of the population blame the government for the deepning of the conflict over the Labour law. 37% blame the unions.Only 2% did not choose who to blame, showing the sharp polarization of opinion. Another poll gives 59% blaming the government and 40% the Unions, with only 1% of Don’t Knows. Highly informative article. I was, egoisitcally, particularly interested in the comments on ‘Nuit Debout’. In my blog post,http://blog.artlyst.com/art-of-resistance/nuit-debout-the-dream-of-resistance/ I was somewhat dismissive, since the ‘dream’ seemed to take too much precedence over the ‘strike’. Thanks to all writers in Dream Deferred. What is the real orientation of the present workers movement? How the spontaneity of workers movement developed? Is there is any relation of 1968’s movement? How the women workers react and participate in the present struggle? I am new to France. What part did the E.U. play in the new Labour Laws? I understood that because France has such substantial debt they are being forced to make these compromises or their loans will be called in.